Tayu-ura appears just as it does in the song, with the same name back in the Fudoki described as "Tayu-Bay, 60m wide (just enough for two boats)" , showing its origins as a true inlet size bay indeed. It probably had enough depth for boats to sink their anchors, but the Tayu bay itself wasn't particularly deep, but with the island 'Terajima' positioned to buffer the north-westerly winds, it was a good port in terms of its formation. The name 'Tayu' can mean 'patience' and its other name 'Tae' contains the sound 'e', which can mean 'Inlet'. 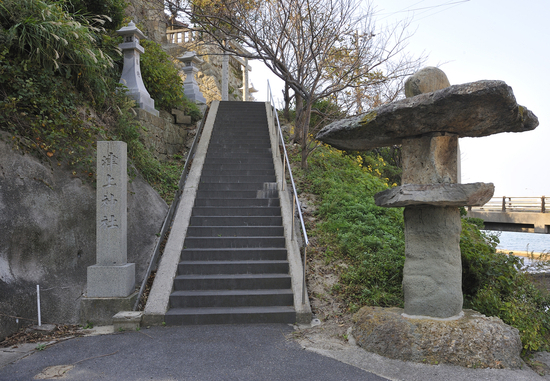 The shrine protecting the bay, Tsukami -jinja is enshrined in Miyama -yama (mountain) in the center of the village. It is listed in the 'Unyoushi' under the name Tsukami Myoujin and described as "....containing a salt cave to the west of the shrine where worshippers in the past would go to collect the salt needed to purify themselves during their pilgrimage." This information would appear to tell us that Shiokomi purification this was a common ritual practiced at the time. The enshrined deities, Hayaakitsuhiko-no-kami and Hayaakitsuhime-no-kami are offspring kami of Izanagi and Izanami, they are known as 'Minato no kami', or water gods, a suitable name for gods in the Tayu Bay village. 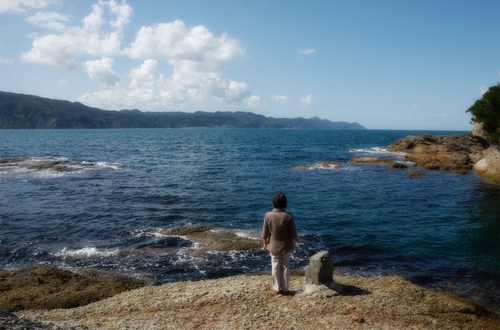 As written in the Unyoushi , Tayu bay had places called 'Hiyuga ana' and 'Shio ana' perfect for Shiokumi ( drawing water from the sea), a ritual practiced to mark the end of the mourning period in this area? 'Tayu', also has a meaning of 'hand' and 'hot water', thus making it a most fitting place for purification and cleansing. A long time ago, down the north side of the mountain where the Tsukami shrine is located, there used to be a salt cave. However, it was filled in during construction of the bridge that links across to Terajima island in the west. Today, on a rocky area on the east side of this bridge, stands a memorial stone to this fact carved with the word 'Anashio' (salt hole). Looking out from this area over to the Shimane Peninsula offers a spectacular view. The Tayu tondo (new year festival) involves a boat made of straw being sent out into the sea. The bamboo containers holding the shiokumi sea water that is collected for the end of mourning ritual are offered at the Ryujin shrine. 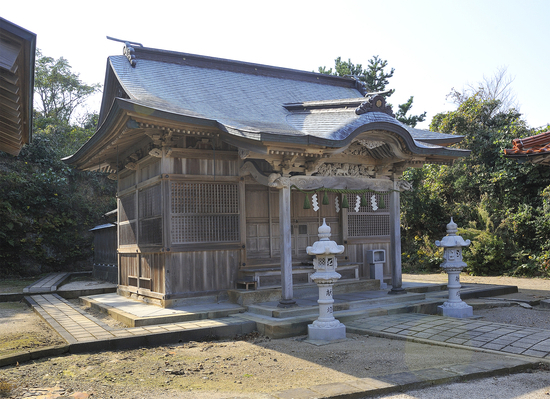 This is located on the left side of the Dainichido shrine on a hill opposite Tsukami jinja (shrine). In the vicinity of Dainichido, in the village at the top of the hill at the back of Zenyoin shrine, one can visit the final resting place and see the grave and memorial stone dedicated to five loyal imperialists of the Iihan (clan ) from Tottori Prefecture. They were active during the last days of the Tokugawa shogunate in the late Edo Period. The men, including Takuma Hanroku were said to be the model for the novel, "Kurama Tengu". At the base of the hill is a memorial hall exhibiting the swords they once possessed. It's said that Takuma Hanroku and his group, en route to the Choshu Domain via Mihonoseki from Yurihama town (between Totori and Yonago cities) made a stop at Kataku. In Totori prefecture, various literary works have been published honoring the patriots and the Tayu incident is also well known there. Senryuji temple in Kurozaka, Hino machi, Tottori where Takuma Hanroku and the others were confined ahead of their mission to Choshu houses Buddhist memorial tablets and other articles pertaining to the imperialists.